In your customer's kitchen, when it comes to function and design you should opt for a winning team: check out the sink combination units to find the matching tap for any sink. High-quality, robust materials guarantee that your customer will be able to enjoy the combi unit for many years to come. 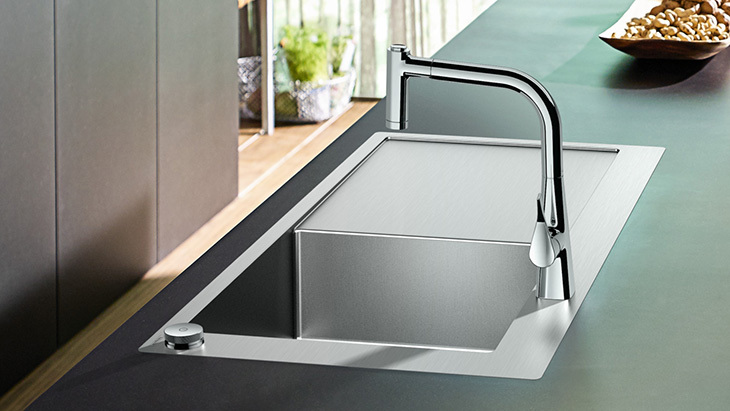 As well as the kitchen tap and sink, all the elements are coordinated and are included in the combination unit for immediate installation. These innovative all-in-one solutions also stand out thanks to their new, sophisticated operating concept. On the sink and tap combination units, the control unit is installed on the front rim of the sink. Two control units are available: the ergonomic handle controls the water temperature and volume. With the Select button, you can simply press it to turn the water on or off at the touch of a button, and turn it to open or close the drain. Check out all the available sink sizes to select the appropriate installation solution – surface-mounted or integrated flush. Each mixer has two available variants, which combine perfectly with the sink. All the necessary components are included in the combination unit. Our sink combination units constitute much more than just a sink and a tap. With one collective order number for each option, these all-in-one solutions will make your planning and ordering process much easier. All the components for installation, connections and waste set are coordinated with the bowl and tap, and they make up a complete system. The integrated sBox offers you an extra selling point for this system solution: The hose box tidies up the clutter underneath the sink, and makes it really easy to use the pull-out feature. The hose can be pulled out and retracted smoothly, and is protected from getting jammed up or damaged in the box. A hose weight ensures that the hose is routed securely and quietly. Multiple installation options, even in low, narrow floor unit modules.